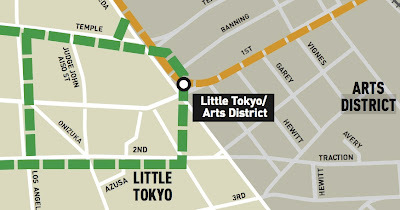 The MTA is holding another series of meetings to update the community about the planned regional connector going through Little Tokyo. Jeff blogged about the last meeting back in August, and raised some valid concerns about how it could impact the neighborhood and its businesses. It's important to come out to these discussions and provide feedback, so hope folks can make it. Thursday, October 16th, 12:00 to 1:30 p.m.
Tuesday, October 21st, 6:30 to 8:00 p.m.
For additional information, call 213.922.7277 or visit their website.